It's Big Chili time! Saturday, September 8 from 10am - 5pm. 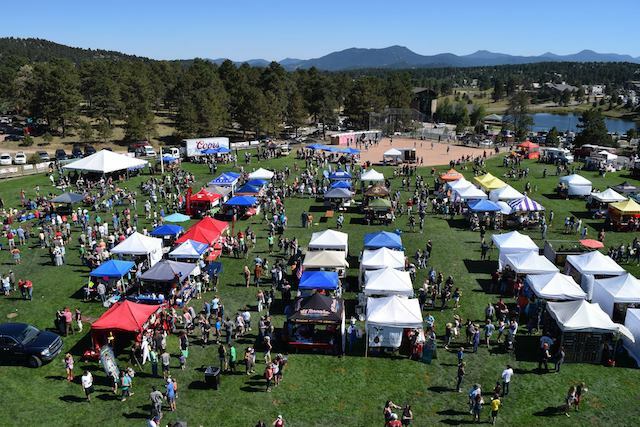 Enjoy artisans, retail vendors, live music, chili, beverages, kids area, chili, watching the firefighter challenge, chili, food and FUN! Come on out and support your local Evergreen/Conifer area fire fighters! 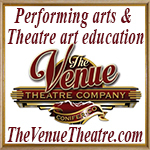 TICKETS ON SALE ONLINE NOW until Wed Sept 5. After then, buy at the gate on event day for $20. Visit www.bigchili.org for tickets and info. Admission includes access to all vendors, food & beverage vendors, free chili tastings, live entertainment and opportunity to vote for your favorite chilis! Food & beverages available for additional cost. No dogs, canopy or clam shell style tents allowed by patrons at Big Chili. THIS IS IT! Today is the last day to purchase DISCOUNTED admission tickets to the 2018 Big Chili Cook-Off, this Saturday, September 8 at Buchanan Park in Evergreen, 10am - 5pm. You have until 5pm TODAY to get these tickets, otherwise you will need to purchase at the front gate during the event. 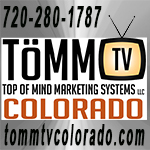 AND the weather on Saturday will be spectacular - mid-80's in the mountains! Perfect. 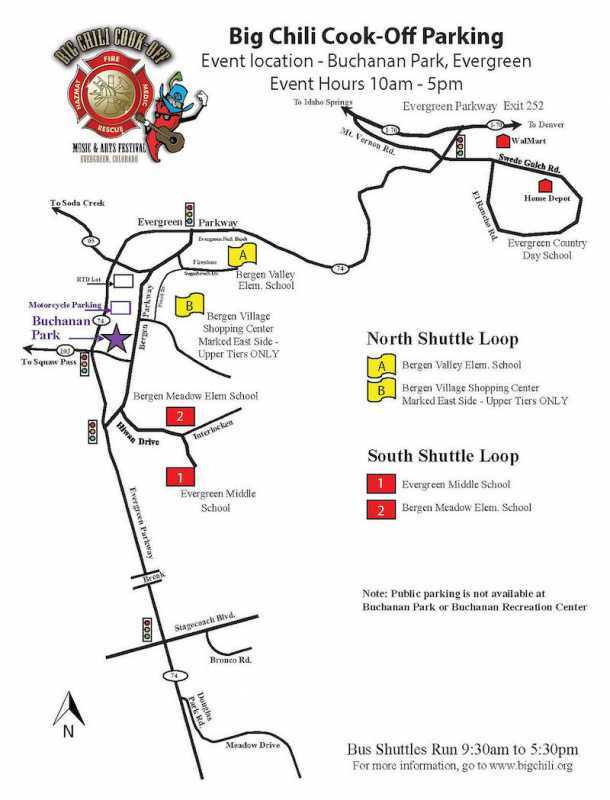 Enjoy live entertainment (Subject2Change, The Steve Thomas Band and The Long Run), business and artisan booths, food vendors, kids area, firefighters obstacle course AND CHILI, CHILI, CHILI!! Vote for your favorite! Comedian Sam Adams is our event Emcee! The event benefits the Evergreen/Conifer fire departments. And yes, there will be firefighters there! Spend the day with us - supporting our local firefighters!! Buy tickets today till 5pm at www.bigchili.org . We still have openings for some volunteer positions as well. Please consider donating a few hours to this wonderful community event! Volunteers receive an event t-shirt and free admission. 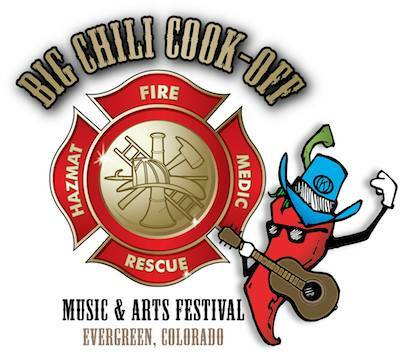 Complete the online form at www.bigchili.org and our volunteer coordinator will be in contact with you. 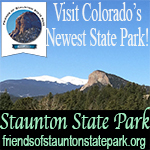 Directions: Buchanan Park is located in North Evergreen, approximately three miles south of I-70, at the corner of Highway 74 (Evergreen Parkway) and Squaw Pass Road, adjacent to Buchanan Recreation Center - 32003 Ellingwood Trail, Evergreen, CO 80439. 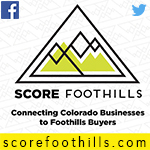 Evergreen is located roughly 15 miles west of Denver, and 11 miles west of Morrison/C470 area. Remember: No dogs, canopy or clam shell style tents allowed by patrons at Big Chili. See you all tomorrow! Our thanks to all of you for supporting this event, and our fellow firefighters, every year. Stop by our booth and say hello! 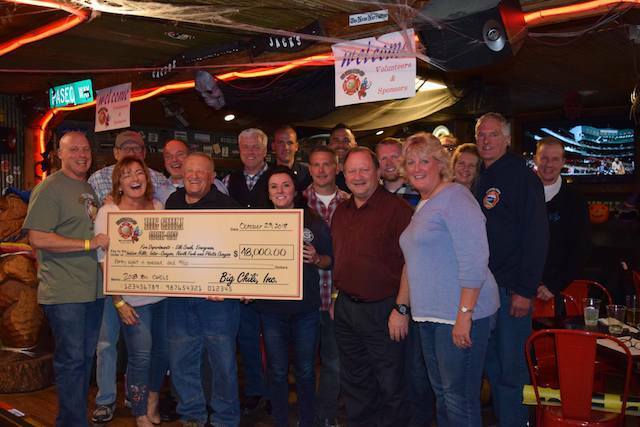 The Big Chili Board of Directors presented the Evergreen/Conifer fire departments with a check for $48,000 from proceeds of this year's Big Chili Cook-Off at last night's Check Presentation Party! This was a record donation for Big Chili. Each fire department received $8,000! Special thanks to our sponsors, volunteers and community for helping to make this event happen. And most especially - THANK YOU TO THE FIREFIGHTERS FROM - Elk Creek Fire Department, Evergreen Fire Rescue, Indian Hills Fire Rescue, Inter-Canyon Fire Department, North Fork Fire Department and Platte Canyon Fire Department. Thank you for all you do!! Special Shout Out THANK YOU to Gary and Megan at Cactus Jack's for sponsoring Big Chili and hosting our celebration evening! THANK YOU ALL FOR A WONDERFUL EVENT!